Many, many years ago I worked briefly in a nursery that sold air plants (tillandsias) and it was here that my love of bromeliads developed. There are not many that can be grown outside in the UK and Ireland though I have frequently toyed with planting Bilbergia nutans outside, always, eventually, without success. 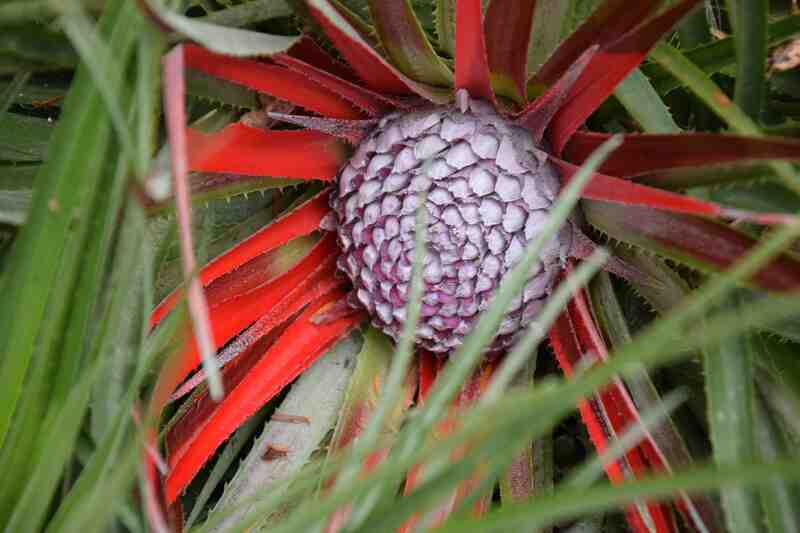 But the spectacular Fascicularia bicolor, from Chile, can often be grown outside in mild areas and, when each rosette blooms, just before it dies, its is superbly spectacular. As the flowers develop the leaves in the centre of the rosette change to bright red and apparently Helen Dillon calls it the ‘monkey’s bottom’ plant. It is native to Chile where it grows at high altitude, among and on rocks and it was introduced to Europe in 1851. Things are not that simple though and there is one species but two varieties. 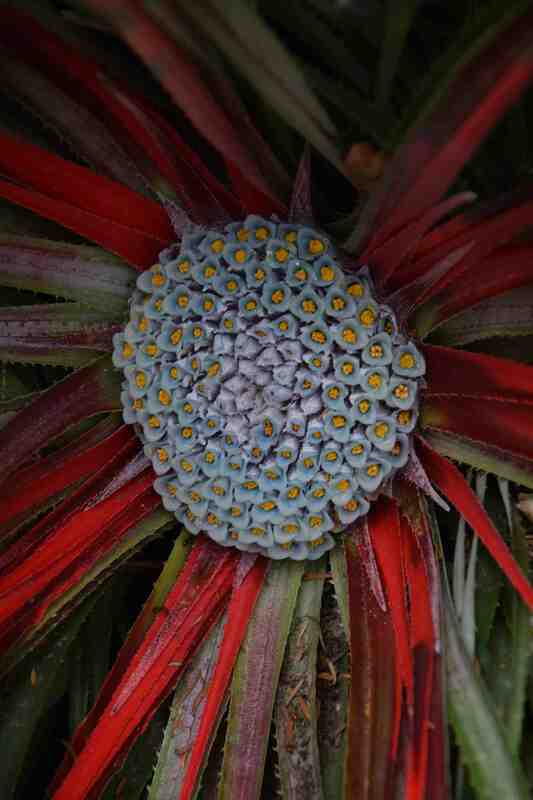 Fascicularia bicolor var bicolor grows on rocks and var. canaliculata (which is what this plant is supposed to be) grown on trees. In the garden both will grow in the same conditions, in light, well drained soil in part shade in the rock garden. For some reason the main difference seems to rely on the flower cluster with var. bicolor having flowers that open from the outer ring of the cluster first and var. canaliculata having flowers opening in the centre first. So although this plant was labelled as var. canaliculata it must be var. bicolor. Is that clear? Either way it is a beautiful plant. From experience I have to say that you should make sure you get the ground free from perennial weeds first because there are few more painful plants to weed among. It will grow to about 40cm high and I once had to look after a clump that was more than 1m wide. As the rosettes die after flowering they need to be twisted and pulled from the clump. It also collects leaves and debris and needs a fair bit of housekeeping to keep it looking pristine. I love this plant but it does seem to collect leaves in the centre of the flowers. I have propagated it by pulling a large section off, but it was a very painful business. I probably still bear the scars. We were given one of these, and not knowing what to do with it, put it on the shelf in one of our garden ponds. It now has assumed its red central fringe with a beautiful plain ivory flower in the centre. It enjoys a sunny position. And your right – not a comfortable plant to work with. It is interesting that you have it in the pond! I would not have thought it would have liked stagnant water at all – I assume the roots are above the water line. I looked after one in a conservatory (at Myddleton House – see tomorrow’s post as well as some recent ones) and it was one of the worst jobs getting fallen leaves out of it!